As seen hanging in Sheldon Coopers office on The Big Bang Theory. 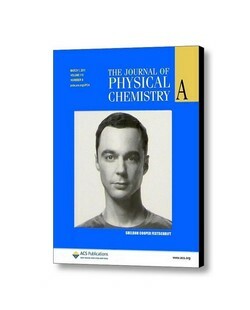 Prop replica of Sheldon on the cover of The Journal of Physical Chemistry. Framed cover is actual magazine size. 8.5 X 11. Framed in a black borderless frame. Ready to display. Would look great in any room, den or office. Cover is EXACT replica of actual prop.